Recently, while waiting for a flight to take off, I was pleasantly surprised and genuinely entertained by a flight attendant who was fed up with the canned safety instruction speech. I just love airline personnel with a sense of humor. 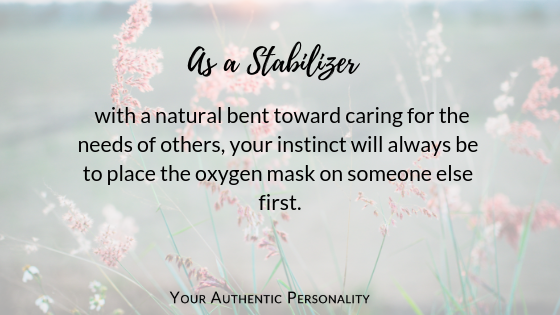 As a Stabilizer with a natural bent toward caring for the needs of others, your instinct will always be to place the oxygen mask on someone else first, regardless of earning potential. But if you don’t take care of yourself first, you could end up passed out in the aisle, and unable to help. In order to be of the greatest service to others, it’s important that you are aware of your energy drainers and gainers. They are unique to your design. If your best friend or husband are different personality types (and usually they are), they probably won’t be drained by these stressors or energized by these self-care acts like you are. Don’t worry, nothing is wrong with you. All you need to do is recognize the additions and subtractions of your Stabilizer type so that you can put on your oxygen mask when necessary. High Emotions. If you are raising girls or extroverts, this is your world. Conflict. When kids are fighting, or family members are mad at each other, this is hard. Endings. For example, when friendships fizzle, someone moves away or says goodbye. Fast Pace. When life is frenetic, moving at the speed of sound, it wears you down. Change. Like the loss of favorite traditions, regular routines or just the status quo. Multi-Tasking. You become overwhelmed when multiple demands press on you. Peace and Quiet. Silence may be golden for others, but it’s platinum for you. Comfort. Give yourself permission to snuggle up with cushy pillows. Fill your tummy with comfort. Comfort your body. Rest. With a more subdued energy than the other types, it’s imperative that you get the rest you need. Affirmation. “Whatever is true, noble, pure, and lovely—think about such things. Whatever you have learned or received or heard from me, or seen in me—put it into practice. And the God of peace will be with you” (Philippians 4:8–9). Family Time When you are in your nest with the fam, it pushes the needle of your happy meter to high. Dear Stabilizer, please take good care of yourself. When you do, you will be stewarding the life you’ve been given so that you can steward those under your care. For more information, check out the Stabilizer ebook or What’s Your Mom Type? 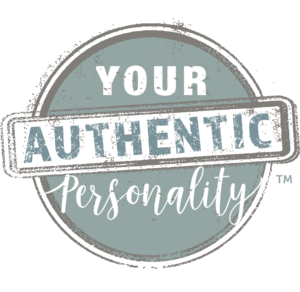 : Discovering God’s Design for You.